Almost any fashionista have this difficult experience: two clothes or accessories are so cute and attractive that it seems impossible to choose one of them. 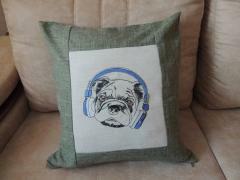 But if you use Stylish pug-dog machine embroidery design you don’t need to choose! 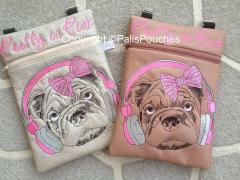 You can make as much items with this design as you want: really both of these bags are equally interesting due to decoration with trendy dog having big headphones and striped bow. 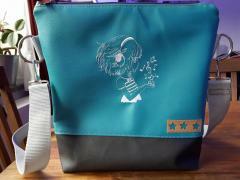 This is close up plan of pretty schoolbag made by Music. It let us to examine its front side in all its details. It really deserves your attention: just look what beautiful picture was chosen for this work piece. 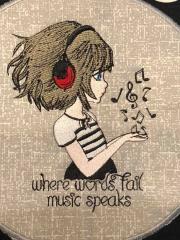 It is Where words fail music speaks 2 embroidery design. This image is executed in classic anime style and reminds about simple pleasures in our life. 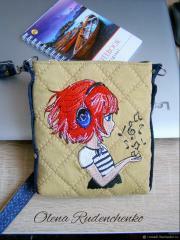 This is view from top to original and practical shoulder bag made by Music. It is equipped with durable zip and convenient handle for wearing on shoulder. It is spacious enough to hold some copybooks and pencils. 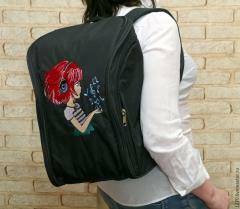 Furthermore its front side is embellished by Where words fail music speaks 2 embroidery design. It seems that’s all what schoolgirl may want from this bag. 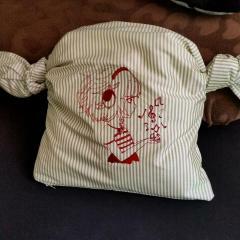 This is front view of pretty little bag made by Music. It is designed for girl who likes music and cartoons. It is not very big but spacious enough to hold copybook and some pencils. 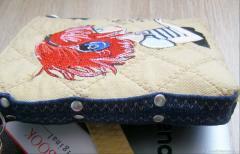 Its front side made of dense denim is decorated with Where words fail music speaks 2 embroidery design. This beautiful picture creates romantic mood for all day. This is nice small handbag made from dense denim of two different colors. Its front side is quilted and decorated by Where words fail music speaks 2 embroidery design. 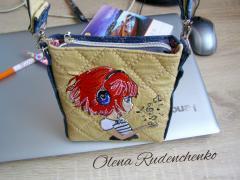 Author of this work piece with beautiful name Music chose very nice picture for this bag. It reminds about simple pleasures which are able to make your every day better. On this photo you may see nice interior cushion and its author behind it. It is decorated with funny portrait of a bit sad dog with big headphones on its head. It is added by warm inscription. It is Stylish pug-dog embroidery design. Author almost saved original color scheme of embroidery sample but you can change it due to your own taste. This is pretty embroidered portfolio designed for girls in light colors. At same time it is quite strict and spacious thing which can be great helper in everyday work. 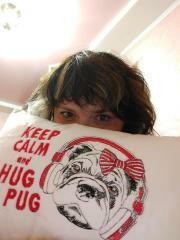 Finally it is nice tool for raise your mood due to Stylish pug-dog embroidery design. It is original portrait of pretty pet which is definitely cool fashionista. It wears funny striped bow and big headphones for listening music. This is view of nice city backpack in usage. You may see that it’s very convenient and spacious: it is possible to carry all things you need inside. Its front side is decorated by Where words fail music speaks 2 embroidery design. 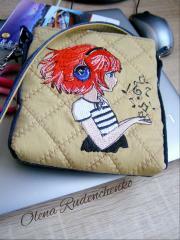 It is portrait of red head girl listening her favorite music. It is made in special manner reminding Japan anime. People know many different words but sometimes all of them are not enough to express the most important feelings, thoughts or ideas. The best solution in this situation is the favorite music: you should just wear headphones and dive into the world of beloved melodies. Where words fail music speaks machine embroidery design let you imagine the magic power of music: for a couple of minutes you may feel as this little girl in big headphones. Sometime when you hear your beloved music in a good mood you want to share it with the entire world. At these moments you may regret that you can’t take and give to other people. But you can imagine it with our Where words fail music speaks machine embroidery design — just try to imagine the music as the flock of light notes like this little girl with big headphones did. There is the simple white t-shirt for girl which is the good base clothing for summer. But due to the funny picture made with the scheme of Stylish pug-dog machine embroidery design it becomes not just the practical thing but the stylish detail of completed look. This t-shirt is ok for the girl who like to be at the center of common attention and use the extraordinary ideas for her image. There is the nice example of youth style in the clothing which reflects not only in free silhouette of this pretty green hoodie but also in the choice of embroidery sample for its decoration. Stylish pug-dog machine embroidery design is definitely one of the best options for this clothing. It is the bright and unusual accent of its front part which makes it unique and serves at the color accent at the same time. There is the bright interior cushion. Its composition is based on the contrast between brown and white colors used for its borders. Its center is the picture of funny dog in pink headphones with the bow of the same color on its head. Stylish pug-dog machine embroidery design is the portrait of a bit sad pet which looks right at you. It is made with just three colors which makes the very expressive combination. This is totally nand made blouse which shows elegant and original taste of its author. Its silhouette and color scheme are quite simple. But it has one little detail which doesn't let it to be boring. 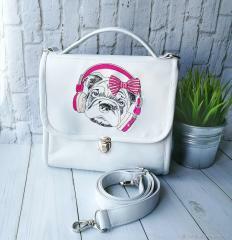 It is Stylish pug-dog machine embroidery design. Portrait of little sad dog in big funny headphones and small striped bow on its left ear will make you smile in spite of your real mood. This is funny picture of stylish dog which likes listening music. It looks so trendy in big headphones and striped bow on its left ear. Smooth light background is great idea for this sample: Stylish pug-dog machine embroidery design looks like painted with black pencil. If you look at it more carefully you may note some details which makes it more interesting. Headphones on dog's head are decorated with sequins and bow is added by some beads. This is nice embroidery sample which can be good idea for decoration of clothing or any textile accessories. Where words fail music speaks embroidery design is especially suitable for persons who like music very much. Each of them sometimes feels himself as this girl collecting listened sounds at her little hand. This inscription is true for many situations in everyday life: from sad events to big gladness which requests to share it with others. There is the unusual way to use embroidery for making the textile accessories for decoration of home interior. 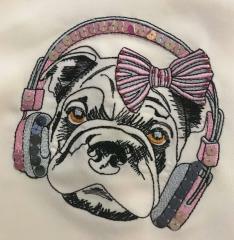 Here you can see the padded stool with Stylish pug-dog machine embroidery design: it is the funny picture of a bit sad dog which wears the stripped bow on its head and likes to hear music through the huge headphones. Due to this embroidery sample the piece of furniture can be a true highlight of the hallway or living room.